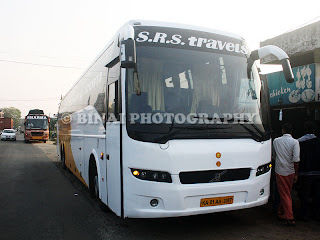 I had just got off the bus that morning – after a scintillating run in a Kallada G4 iShift Volvo B9R. To top it, I reached office later than usual. I was already sitting in front of my computer browsing on RedBus! I found that SRS and some others had tickets for the next day night to Ernakulam. Another trip? Yes! I was booking another trip to Kerala that very weekend! I initially thought of calling my contacts for seats – but then thought of trying something different this time. 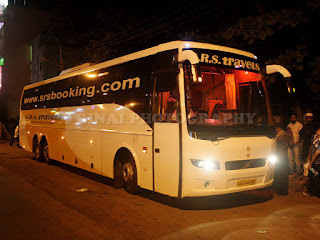 Headed straight to the SRS Travels website and found some 6 vacant seats in their B9R to Ernakulam (Thiruvalla bus) the next night. The only window seats were in the first row – without much rethinking, I booked seat #2 – first row, left side window seat. The system showed it was a 44 seater bus – I thought it would be a new bus, since SRS’ old B9Rs were 49 seaters. I was excited about my first journey by SRS - but was that really worth the excitement? In my office, it is almost fixed that there would be meeting at evening on the days that I have to travel. This day was no different – but thankfully, the meeting got over quite early. I left office on time, and made it to home by around 6.30pm. My brother dropped me near SRS office in Madiwala around 2100hrs. I showed my ticket the office – the guy at the counter replied “Please sit down sir”. First impression – excellent! I went out to meet some people around Madiwala, and also met one busfan as well. I’ve spoke this person quite a lot of times, but never had the fortune to meet him – it was a nice time meeting you Rejoy! I went around meeting my contact at G4 – he was furious on hearing that I was travelling by SRS that night. He even offered a ticket to Ernakulam in G4’s Kottayam bus – I politely declined. I headed back to the SRS office at 2140hrs – the bus was scheduled at 2145hrs. I decided to check out the office – it is a fairly big office – no fixed furniture was present, but a lot of plastic chairs were strewn around. There was one fairly clean toilet as well. They were announcing buses over a PA system. The seats were full, and I decided to stand on the road. There was a steady stream of Kerala bound buses at that time – the petrol pump outside Friend’s travels was bustling with activity all the time. I saw an SRS multi-axle bus approaching the office at around 2159hrs – it was an old bus (KA-01-AA-2087). 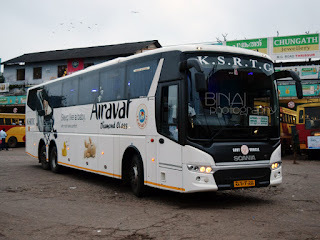 Just as the bus passed the office, they announced on the PA system, “Bangalore-Ernakulam-Thiruvalla Volvo Multi-Axle bus via Thrissur, Ernakulam, Vaikom, Kottayam, Changanassery”. Oh! So that old bus was for me! The bus went a bit ahead and parked near the signal. I took some shots of the bus and then joined the (un)orderly queue to board the bus. There was one person from the office standing with the chart, checking tickets and letting passengers board, while the cleaner was standing near the luggage bay. The bags were clearly tagged before being stowed into the dickey. I got into the bus – the interiors appeared tired, but was clean and well kept. The lights had metal garnishes (similar to those in Airavat Club Class Volvos). My co-passenger was a fairly elder gentleman – he had booked to Thiruvalla! The bus started off at 2208hrs – the person checking tickets informed the driver that they had to pick parcels from Hosur. All the 44 seats in the bus were taken – and all of them boarded from Madiwala! There were two drivers in the bus – the person at the wheel was in uniform while the second driver was in black dress (preparing to go to Sabarimala). The second driver was on his first trip with SRS, while the first driver seemed to be a veteran. The cleaner was also on his first trip in the route. There was light traffic upto Silk Board – after that the road freed up. The bus took BETL and headed towards Hosur. 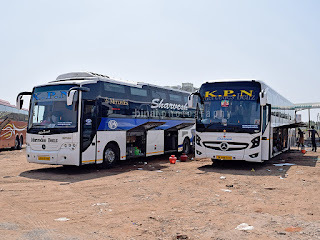 (BETL is now a standard for almost all private operators heading to the south – KPN is an exception, since they have a pick-up at Bommanahalli). The second driver asked the cleaner to play a movie – he switched on the system, and started playing the DVD that was inside the player. It was an unidentified Tamil movie – the disc started playing from the climax. Volume was set to very low levels – there was no point even trying to watch the movie. The rear screens were opened and lights were switched off too! SRS had modified the night lamps and they had installed strips of LED lights along the gangway – so light does not fall on ones face, but the walkway is well illuminated. I switched on my GPS and tracked the bus for some time – the driver was consistent at around 95kmph, hitting a top speed of around 107kmph at one point on the BETL. The driver maintained speeds of around 90~95kmph all the time. Attibele was a mess as usual – the toll gate was chaotic and so was the TN RTO Check post. The driver moved over to the opposite lane and beat the traffic. 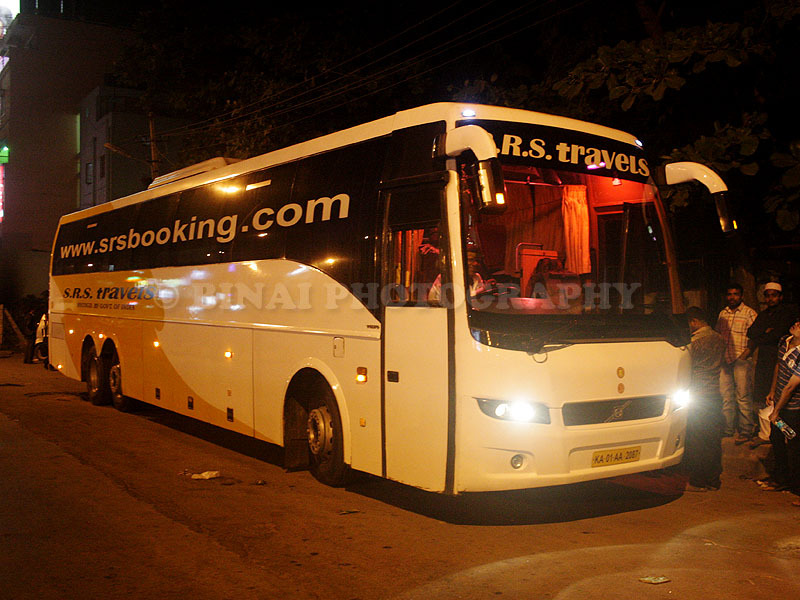 The bus stopped at Hosur (opposite to the bus station) at 2249hrs – I was expecting them to take forever to load parcels. But they finished the entire operation in a minute – we started moving at 2250hrs! The movie got over now – the crew weren’t aware of the same. I asked the crew to switch off the tv – the driver was surprised! How did the movie get over so quickly?? He immediately asked the cleaner to switch on the TV – he went behind the closed the rear screen too (+1 to the crew for this). As the bus passed Shoolagiri pump, the crew were saying that this hotel is a self service and they waste a lot of time – c’mon boss! The hotel has service, and they are fairly quick too. I slowly started sleeping as were crossed Chinnar. There was some traffic on the road and the bus was moving fairly slowly. I woke up hearing some commotion outside and someone was blowing a whistle – almost continuously. Our bus was stopped as well – I quickly recognised the place. We had stopped for a dinner (!!) at that shady wayside shack called Hotel Uthaiyah! This is a place frequented by those local government buses and some private operators – this place specialises in selling everything at double the price. I was wondering why did our bus stopped for dinner and that too at such a place! Btw, the time was 2342hrs. I got off the bus and walked around for some time – it was chilling cold outside. Buses were parked all around haphazardly – and the security guys were whistling all the time. It resembled a government bus station. The crew got back to the bus around 0010hrs, and the bus got moving at 0014hrs. It took us around 5~7 minutes to get out of the place. 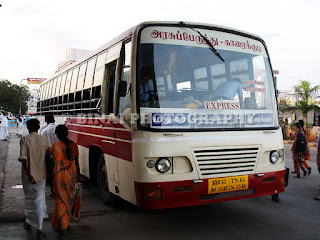 The bus stopped again at Krishnagiri to pick-up parcels! We started moving from there at 0035hrs. I slept off after this pick-up. Given the pace of our progress, I was sure we wouldn’t reach Ernakulam before 8AM. I resigned to fate and started sleeping. My co-passenger was finding it very hard to sleep – after all, it’s an XXL sized person on the nearby seat. I slept peacefully till I realised that the bus had stopped somewhere (again!). The time was 0215hrs – and the place was Salem. The driver had stopped for a tea break – that too less than 2 hours after dinner break! We started off at 0224hrs. My GPS had recorded the top speed till then to be less than 100kmph. I slept off again – this time, the sleep was undisturbed for a fairly long time. I woke up only when the bus shook violently as it hit a rough patch near Vadakkenchery – the time was around 6AM now. So, I managed to sleep around 3.5hrs continuously. The second driver was now at the wheel. The second driver was now on the phone trying to find out where was the Thrissur office, since he had to drop parcels! But there was no response from the other end. I tried sleeping for some more time, but the roads were horrible and the bus was rocking all the time. After some minutes of futile attempts, I decided to sit straight. The second driver called up the SRS office at Ernakulam, and they informed the Thrissur agent to pick-up the parcels. We stopped at Mannuthy around 0716hrs. Around 5 passengers got off here, while the crew were busy unloading the parcels. The agent’s guy was there – they had to sign on a register while taking possession of the parcel! The driver used this as a tea break as well. The bus started off at 0723hrs. We had parcels to unload at Chalakkudy as well – the driver got busy calling the consignee there. The bus made slow progress towards Ernakulam – the driver stepped up speed to around 95kmph after entering the 4-lane section. We stopped at the beginning of Chalakkudy flyover at around 0800hrs – the wait continued till 0809hrs. We waited and waited for the consignee to come and pick-up the parcels – all because the crew need to get their register signed! (Awful policy). The bus continued it slow progress and we reached Ankamaly around 0825hrs. Around 2-3 passengers got of here. After Ankamaly, the bus turned towards Ernakulam and continued its progress – my co-passenger felt something was amiss and asked the driver why he was going towards Ernakulam. The driver replied back, the route is via Ernakulam, Ettumanoor, Kottayam, and not via Muvattupuzha. I saw my co-passenger’s face going gloomy – the time was already 0830, and there were very weak chances of the bus making it to Thiruvalla before noon. I felt pity for him. We stopped at Paravoor Kavala (around 3 kms before Aluva bypass junction) to drop off a passenger (0844hrs). By now, traffic had built up heavily and the bus was finding it really hard to pick speed. We stopped again at Kalamassery (Premier junction) to drop off a passenger (0856hrs). After this point, I got off the seat and went to the driver to have a short chat. I asked if the bus regularly reaches only after 9 – he replied that it was his first trip. I asked him about the need for a dinner break – he replied that they start from the garage at 1930hrs, and blah blah. He had no answers when I asked if they could’ve stopped at a better place instead. I made my displeasure known to him. The bus finally reached Edappally bypass junction at 0906 hrs. I wished bye to the crew and got off the bus. A lot of passengers got off here. The bus would not have reached Thiruvalla before 12~12.30hrs – I felt really sorry for the passenger booked to places beyond Ernakulam. Afterall, they had paid Rs. 1199 (more than the market rate) for a seat! 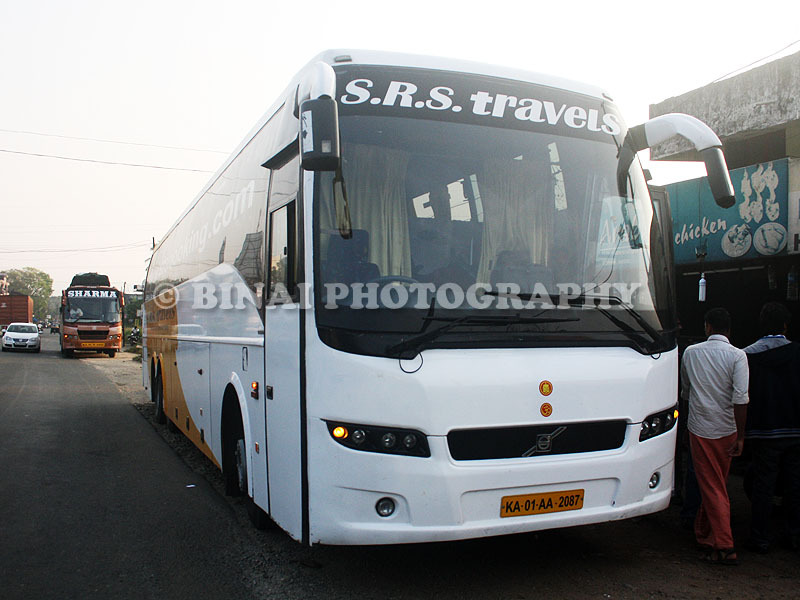 Concluding remarks: The bus, KA-01-AA-2087, had run some 6.6lakh kms. Maintenance was really good – no squeaks or rattles from the bus. The seats looks a bit worn out, but did not emit any smell. The interiors were really fresh – the curtains were clean and appeared fresh. Proper full sized fleece blankets were provided to passengers. Water was not provided. Luggage tags were used for all passenger baggage kept in the luggage bay. The crew were well behaved to passengers – the second driver patiently answered me even when I was questioning him in the morning. There was once instance where a truck suddenly cut across our bus – the crew remained calm even at that point. The bus maintained steady speed throughout the run – I slept for a good part of the journey, very comfortably. SRS needs to get their basics right here – the bus lost lots of time waiting for luggage loading/unloading. The draconian system of having to get receipts signed delayed us badly. That unwarranted dinner break and the tea break soon after that all contributed to the delay – the dinner break could’ve been avoided. I was terribly disappointed by my first experience with SRS. Will I take this service again: Ah! Never again. I hope I never have to take SRS to Kerala ever again.